Breaking news: Canada's current account balance hits near-record levels! What with the fall of the federal govt last night and the upcoming election, I'm pretty sure that few paid much attention to today's StatsCan Daily. That's too bad, because there was some interesting stuff there - and of far more importance than the tsunami of polls and election speculation that dominated today's media headlines. Firstly, there's the current account balance. I suppose it's not surprising that an oil-exporting country is running current-account surpluses these days, but a) energy accounts for only about 10% of Canada's exports, and b) the CAD has appreciated by about one-third over the USD over the past four years. If and when the US current account balance ever unwinds, just what would it take to get the Canada-US trade deficit down? Then there were the payroll employment, earnings and hours data. Employment is up, unemployment is at its lowest level in 30 years, but average weekly earnings are up 2.8% over 2004 - only slighly above inflation. Why? Add to that the September employment insurance numbers. New claims are up by 3% over September 2004, but total claims are unchanged. Are those who left finding jobs or dropping out of the labour market? All interesting questions. None of which will be addressed over the next 2 or 3 months. Here's the problem with General Motors. Would you buy a car, used or new, from a company that wrote the following sentence: "The Buick LaCrosse is conquesting sales at impressive rates ... "? Not corporations. Oh sure, maybe someone employed by a corporation has to write out a cheque to the order of the Receiver-General, and the cheque may even have a corporate logo on it. But corporations do not pay taxes - people do. The question is which people. Or, in the language of public economics, what is the incidence of corporate taxes? It is typically the case that those who advocate increasing corporate taxes intend for them to be paid by the owners of capital. The analysis goes as follows: Corporate taxes are applied to profits, and since profits are distributed to their owners, corporate taxes are borne by capitalists. But that’s far from being the end of the story, at least, not in a small open economy such as Canada. The rate of return on investment is determined by the world supply of savings and the world demand for capital, and since Canada has only a small share of the world capital markets, what happens here has essentially no effect on that world rate of return. If an investment project in Canada can’t generate that rate of return, there are any number of others that can. Suppose that world rate of return in 9% a year (I’m picking number out of the air here so that the math works out nicely), and that the Canadian corporate income tax rate is 40%. Investors would therefore require that a Canadian corporation generate a pre-tax profit rate of 15%, so that the after-tax return is 9%. Now suppose that the tax rate goes to 50%. Since investors can always get a 9% rate of return on the world market, the only way a Canadian investment project can survive is if it generates pre-tax profits at a rate of 18%, so that the after-tax rate matches the world rate. If it can’t, investors will simply shut it down and move their capital elsewhere. Who pays for corporate taxes? Not owners of capital, even if they were the original target – they still get the world rate of return. The people who really pay are consumers and workers. It would appear that the other rich countries' policy-makers have learned this lesson: countries that are more open have found that they are obliged to keep corporate taxes low, while those that are less open can have higher rates. Moreover, the three countries with the highest taxes also have the largest economies. 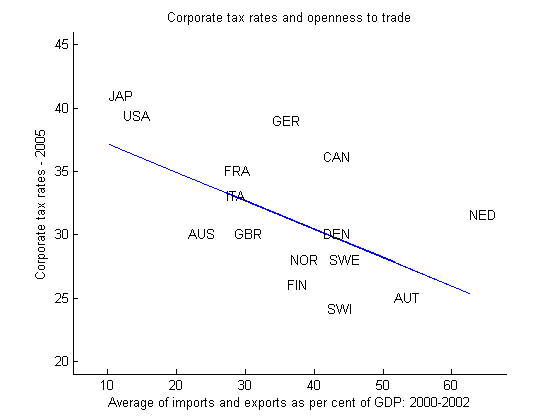 All countries that have similar levels of openness have significantly lower corporate tax rates. The only countries with higher rates are the United States, Japan and Germany: all much bigger and less open to trade than Canada. Despite the recent cuts, Canadian corporate tax rates are still pretty high. Update: Empirical evidence that suggests that the entire corporate tax burden is shifted to workers. A sea change in Canadian federal politics? Today's National Post has two, apparently unrelated columns that suggest we might - just might - be witnessing an important turning point in federal politics. There is a Web site whose name, Jump The Shark, has entered the language. It defines the precise moment when a long-running TV show finally and irrevocably loses its way. A TV show "jumps the shark" (the reference is to an episode of Happy Days, in which Fonzie jumps over a shark tank on water skis) when, exhausted of whatever once made it fresh or original, it gives up any pretense of logic or dignity and simply throws up whatever it thinks the public wants. The federal Conservatives are now hovering at the same brink of inanity, nerving themselves to make the equivalent leap in political terms. Nothing's definite -- it's all "could" and "may" and "understood to be considering" -- but that the party is even thinking about proposing deep cuts in the GST, as reported, is danger sign enough. The party has made many mistakes over the years. It has abandoned any number of long-held positions, jettisoned fundamental principles, watered-down this and tossed aside that. But it has not previously advanced policies that would actually make things worse. Its sins have been of omission rather than commission. So this marks a decisive turning point: If the party adopts this cynical, opportunistic, thoroughly wrong-headed proposal as part of its platform, we will be able to say with certainty that this was the moment when the Conservatives jumped the shark. The idea that an investment banker might also be a social democrat and care about prosperity and social justice has clearly sent parts of the National Post into a collective tizzy. Last week Terence Corcoran and William Watson were interested enough in my NDP candidacy that each critiqued a speech I made recently, "Prosperity and Justice: A New Canadian Democracy." While we disagree about many things, we obviously agree that a tremendous change is potentially underfoot in Canadian federal politics, namely, that Canadians concerned about our economy can trust the NDP. While I am flattered that Mr. Corcoran concluded that the NDP would run partly on the "Summerville pro-growth global-entrepreneur prosperity-is-power wealth-creating track," my influence is overstated. I came to the conclusion some time ago that this "pro-growth" strategy is as much a part of Jack Layton's commitment as it is my conviction. That last point is somewhat difficult to accept: in the last election, Jack Layton's NDP campaigned on a platform of reducing the GST and increasing corporate taxes. But if Mr Summerville knows what he's doing, and if he really does have a certain amount of influence in setting NDP economic policy, then there's the very real possibility that the NDP just might replace the CPC as the safe, responsible alternative to the federal Liberals. Critics of the GST tend to argue that the consumption tax is regressive and should be scrapped. If Mr Summerville is able to persuade the federal NDP to abandon do-it-yourself economics and to use the real thing when formulating policy, then things will get very interesting indeed. I wish him well. In a previous post, I was sceptical of a claim made by the Globe's Murray Campbell to the effect that the policy of redistributing from 'have' to 'have-not' provinces hasn't worked. I've spent some time looking at the data, and one mystery has been cleared up: Ontario's nominal GDP per capita was indeed 103% of the Canadian average in 2004. If you use StatsCan's real (chained 1997 constant dollar) GDP numbers, that ratio is 107%. It's hard to avoid the conclusion that the 'have-not' provinces are catching up to Ontario. ...Ontario's gross domestic product per capita has dropped to 103 per cent of the national average, compared with 112 per cent in 1990. In other words, its ability to help other provinces is deteriorating. That's exactly what we'd expect to see if equalization was an effective policy: as poorer provinces caught up to Ontario, Ontario's GDP per capita would move closer to the Canadian average. Of course, I also think the numbers are wrong. When I looked up the provincial GDP data in StatsCan, Ontario GDP per capita was 108% of the Canadian average - and it's been fluctuating within a point or so around 109% over the past 10-15 years. So is Campbell right after all? I've taken a look at some of the numbers, and I don't think so. I'll try to think of a simple way of summarising the data and come back to this later. I'd like to go, but it's a long way from Quebec City to Vancouver for a weekend conference. The programme looks interesting.